Scenario: Sumukhi is at her brother’s wedding and her maternal uncle (who has been following her like a hawk) sits next to her while she is having the only meal of the day. Maternal Uncle: (long sigh) I am so worried. You are fat, not very good-looking and also have boys as friends. Who would be willing to marry you? Sumukhi: Oh, mama, actually mom is looking for a suitable girl for me. Sumukhi: Didn’t you know? I want to marry a girl. And thus a comedian was born! No, that’s how you get rid of a pesky relative and write a set about it for your show. I have tried and handled every curve ball that has come my way at work with my pleasant personality, as displayed above. I bumped into comedy while I was mending a broken heart. What started as a way to forget my extremely dispassionate relationship became something I enjoyed and worked hard to be better at. 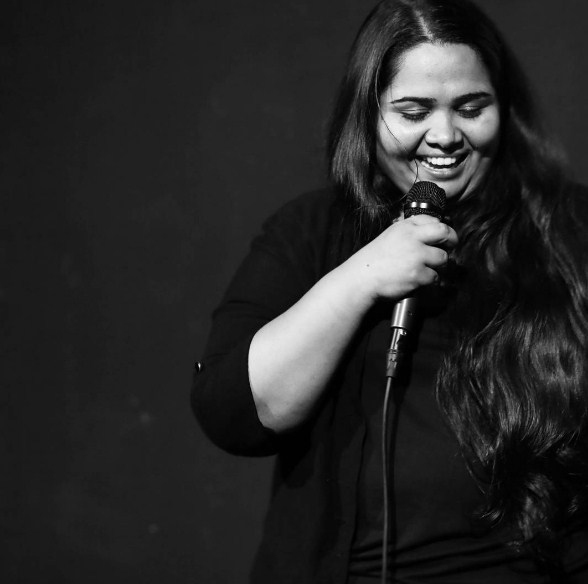 I started with improvisation, moved to writing sketches and finally to stand-up comedy. Doing all three (Oh, stop being a perv!) helped me explore the vast world of comedy as an art form. Comedy, like any other industry, comes with a set of challenges that you have to face, regardless of your gender. Creating regular content, writing as much as possible and drawing a crowd for your shows are some of the many points on your checklist. Then why was it that when I achieved even one of them, I was lauded for being able to do so “as a woman” and also congratulated for being the first woman to have done that? While initially you enjoy the attention, soon enough you should want to be the best at what you do and not be limited by your gender. Thus I gave myself the goal of becoming the best comic rather than best ovary-producing laughter generator. The only way for me to break gender bias and related discrimination is by being so good at my work that I am unavoidable. I am lucky to be at that stage of comedy as a business in India where artists are there for each other and watch each other’s back. I have reserved my judgement of the audience. Let me explain with the age-old trick of a story. As I walked through the aisles of a supermarket, picking up milk and condoms (you know, regular home stuff), I turned into the aisle holding munchies but found entertainment instead. A kind lady in her 40s walked up to me and congratulated me on my work and said that while I was good at comedy “for a girl”, I should take it down a notch. At that point, my brain decided to freeze over, and all I could put together was a mere “Huh?” in response to her suggestion. She was nice enough to repeat the sentence to me before walking off. You don’t expect supermarket aisles to help you realise the ways of life, but then you also don’t expect xenophobes to become presidents. Can I blame her for telling me to take it down a notch? No! Haven’t we all been told that from the time we started exploring the confidence of owning a knee-length skirt in school and every time after that when we have been asked to keep a check on our image and keep it future-in-law-friendly…. Thus, dear women in the audience, if you see one of your kind on stage doing their job as well as they can, cheer them on, root for them, punch the guy next to you who thinks they are funny ‘for a woman’ and not funny as a human being. Tell them they weren’t funny in bits because they need to write better and not because they have a fallopian tube. That is the least you can do ‘for a girl’. I believe that I have been educated by a loving family where my father prayed for and celebrated my birth. The least I can do is to make sure I use my advantage because somewhere out there, a girl is being told to take it down a notch simply for existing.